Looks like a horsecollar and a facemask on that play. I still love the kickoff call. Gotta keep punching. "So much for that." - Cris Collinsworth, minutes after he praised the revamped #Colts run defense, upon LeGarrette Blount running a long TD. Patriots RB snaps (through four drives): Dion Lewis 16, LeGarrette Blount 9. 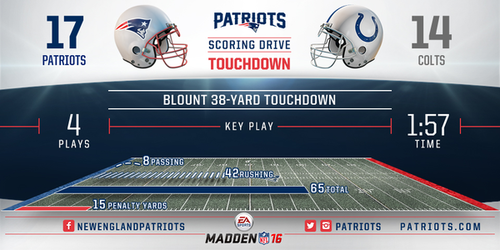 On Blount's 9th snap, he runs 38 yards for TD. NE 17, IND 14. Give em credit: Pats blocked the hell out of that play, and Colts helped with a couple bad angles. The start Blount got thanks to the OL push allowed him to get to ramming speed by the time he was at second level. And there he is finally - Colts' killer LaGarrette Blount on a 38-yard TD run. Blount now has 8 TD's in the past three games against Indy. LG Shaq Mason played in triple-option offense at Georgia Tech. Showed why Bill Belichick said he is advanced as run blocker on that TD run. Instead of having the ball on Patriots' 35 and looking to go up 11, onside kick call goes against Colts. Blount finds endzone. Pats up 3. If you're a couple, and you can't muster the passion to kiss on the kiss-cam ... why are you a couple? Al Michaels just gifted the #Deflategate 2.5 over bettors. Clayton Geathers is questionable to return. Has a knee injury. I gotta say, the growth in Moncrief this year, wow. Long way to go, but this is the best the Colts have played all season. By a large margin. Smart play. Don't be a hero. Get the first down, get down. Not much of a pass rush and short stuff is open over the middle. Missing Hightower. Wow. That is the very definition of an uncatchable ball. Bad call there. 2nd flag of the game on McCourty. 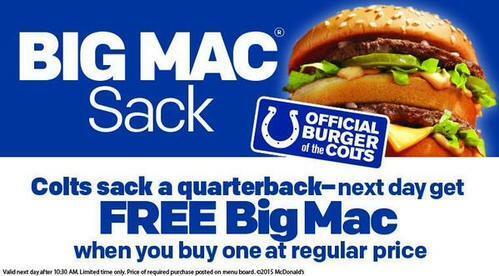 Colts were cooking something up right there before that timeout. Threw Pats for a loop. Great play there by Luck and Hilton.